Birchbox - For Just £99 Get 1 Year Of Birchbox! 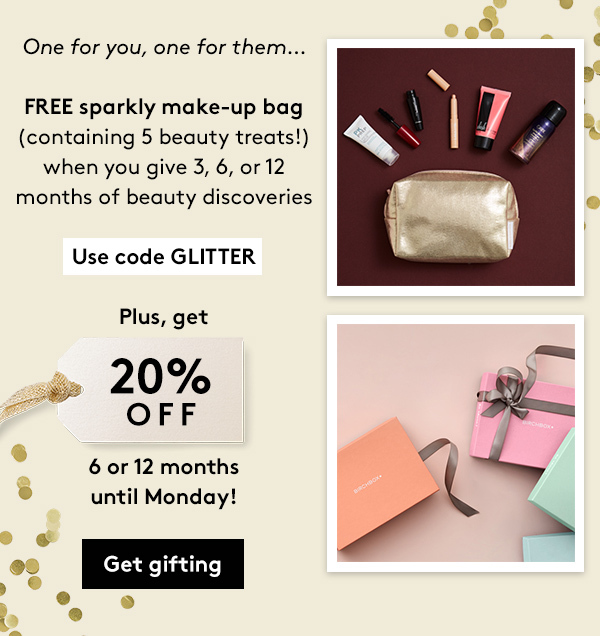 For Just £99 Get 1 Year Of Birchbox! Code NEWYEAR must be entered at checkout and cannot be redeemed retrospectively once order has been placed. Offer available until 31st December or while stocks last. £99 offer price includes delivery, the full price is £145.40 including delivery. After 12 months the subscription will renew at the full price at time of renewal. You can opt out of automatic renewal in the last month of your subscription. Please note that this code is not valid with any other offer or discount, and is not valid on gift subscriptions. Only one use per customer. retrospectively once order has been placed. 20% off ends 11.59PM, Monday 18th December 2017 and is valid on 6 and 12 month gift subscriptions. Not valid on rebillable subscriptions. Offer cannot be used in conjunction with any other offers. Limited quantity available of the make-up bag. You’re receiving this email because you are registered on our website or you participated in one of our contests. If you no longer wish to receive promotional emails from us, you can unsubscribe.